Soumas Court celebrates the people who make Perry a community, past and present. The Court is named for the son of Greek immigrants, George Soumas, who grew up playing in this alley behind The Majestic Shoe Shop, his parents’ store. Soumas is remembered for his service as a World War II hero, mayor, judge, county attorney, storyteller, and friend. A bronze statue of Soumas, designed by Iowa sculptor Chris Bennett, sits at a table near the family store. Visitors entering Soumas Court pass through the Reconfiguration Arches located on each end of the court. 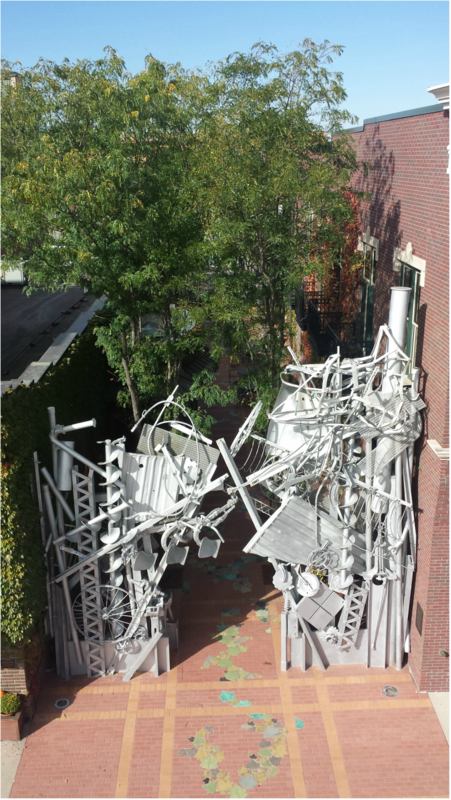 The arches, designed by sculptor Albert Paley, were made of farm equipment, mining rails, metal manufacturing parts, and railroad items, all donated by local residents. These silver-colored sculptures recall the stories of the men and women whose work built Perry. The floor of the courtyard is made of brick. It includes a tile vine of Boston ivy interspersed with oak leaves, designed by David Dahlquist of Dahlquist Clayworks of Des Moines. On the west side of Soumas Court, ceramic plaques depicting the faces of well-known and well-loved Perry-area men and women form a unique Wall of Witnesses. Soumas Court is a public space designed by architect John Leusink and is available for private parties.